A planning committee councillor has admitted it was a "horrible" decision to approve the demolition of a 19th century church. 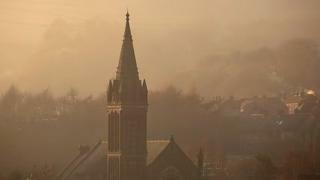 Sandy Aitchison, who represents Galashiels, said it was the only economically viable option for St Aidan's in the town. Councillors agreed the move could go ahead earlier this week. Mr Aitchison said the building was "deteriorating rapidly" and it had been time to come to the "final decision". "It is a horrible decision, it is not an easy decision," he said. "People living in Galashiels and around have been married in it, christened in it and had relations buried from it. "Churches by definition are hugely emotional places, atmospheric places - but now the importance of churches within our communities is sadly decreasing. "So, for that reason, decisions have to be taken and these decisions are never easy."